The objective of this study was to determine the association of Angiotensin-Converting Enzyme (ACE) G2350A polymorphism in Essential Hypertension (EHT) and Type 2 Diabetes Mellitus (T2DM) in Malaysian subjects. A total of 265 samples have been recruited for this study. In order to amplify the 122 bp of G2350A variant of ACE gene, genomic DNA was amplified using Hot-start Polymerase Chain Reaction (PCR) and the PCR products was digested with BstuI restriction enzyme to produce 103 and 19 bp when A is at position 2350. The subjects were ranged from 30 to 84 years old with a mean age of 51.84 years. The frequency for GG, GA and AA genotypes of ACE gene was 41.43, 48.57 and 10% in EHT, 46.67, 36.67 and 16.66% in T2DM, 32.31, 53.85 and 13.84% in T2DM with EHT compared to 61.43, 35.71 and 2.86% of control subjects respectively. The frequency for A allele of G2350A polymorphism was 34.29% in EHT, 35.00% in T2DM, 40.77% in T2DM+EHT subjects compared to controls (20.71%). The genotype and allele frequency of ACE G2350A gene polymorphism differed significantly in patients when compared to controls (p<0.05). Allele A of G2350A polymorphism of ACE gene is associated with essential hypertension and Type 2 Diabetes Mellitus in Malaysian subjects. R. Vasudevan, P. Ismail, J. Stanslas and N. Shamsudin, 2008. Association of G2350A Polymorphism of Angiotensin Converting Enzyme Gene with Essential Hypertension and Type 2 Diabetes Mellitus in Malaysian Subjects. Journal of Biological Sciences, 8: 1045-1050. Several studies have been extensively studied in order to identify the candidate genes in predisposition to essential hypertension (EHT) and Type 2 Diabetes Mellitus (T2DM). In that way, Insertion/Deletion (I/D) polymorphism of Angiotensin Converting Enzyme (ACE) gene was proved to be a genetic marker or an independent risk factor for EHT and T2DM in various populations (Agachan et al., 2003; Feng et al., 2002). But, a recent Meta analysis (Mondry et al., 2005) suggested that I/D polymorphism of ACE gene did not contribute to the presence and severity of essential hypertension. Thus, the physiological function of the I/D polymorphism has not yet been clarified. Due to the inconsistent results of I/D polymorphism in various populations, various linkage and association studies have been stimulated to find the new polymorphisms in ACE gene to identify better markers or actual functional variants. Zhu et al. (2001) found a synonymous coding polymorphism G2350A in exon 17 which precedes the replacement at the nucleotide position 2350 had the most significant effect on the plasma ACE concentration. Besides the effect on plasma ACE concentration, Zhu et al. (2001) reported that this dimorphism was significantly associated with systolic blood pressure with an average increase of 3.2 mmHg with each copy of the G allele. Following that, Mahmmod et al. (2003) shows the association of G2350A polymorphism with EHT and suggested that ACE could be quantitative trait locus for EHT. Moreover, G2350A was also associated with acute myocardial infarction in Chinese Han population (Min Pan et al., 2008). However, there was no significant difference was found between G2350A polymorphism in essential hypertensive subjects in Chinese Han population (Pan et al., 2007) and Myocardial Infarction (MI) in Pakistani population (Iqbal et al., 2004). Type 2 diabetes mellitus is a polygenic disorder has an impact on morbidity and mortality. T2DM is a growing concern in Malaysia (Ooyub et al., 2004). According to the Second National Health Morbidity Survey 1996 (Lim and Morad, 2004), the prevalence of diabetes was 8.3% in Malaysia. The basis for this enlarged risk has been ascribed to cluster of risk factors such as obesity; dyslipidemia and Hypertension which often coexist with T2DM leading to coronary artery disease (United Kingdom Prospective Diabetes Study, 1998). The genetic variants in amino acids of specific candidate genes were also susceptibility to T2DM (Anuradha et al., 2005; McCarthy, 2004). Several studies have demonstrated the association of I/D polymorphism of ACE gene with T2DM in various populations with conflicting results (Feng et al., 2002; Nikzamir et al., 2008; Araz et al., 2001). Therefore ACE gene might be a good candidate gene in susceptibility to T2DM. This case-control study was carried out to assess the value of G2350A polymorphism genotypes of ACE gene and to know the association of G2350A polymorphism with essential hypertension and Type 2 Diabetes Mellitus. Subjects: A total of 265 samples consisting of 70 Essential Hypertensive patients (group 1), 60 Type 2 Diabetes Mellitus (group 2), 65 patients of essential hypertension with Type 2 Diabetes Mellitus (group 3) and 70 unrelated healthy individuals as controls (group 4) were recruited in this study. Upon the approval from the Ethical Committee of the Faculty of Medical and Health Science; Universiti Putra Malaysia (UPM), all the patients who were receiving treatment from May 2006-May 2007 at UPM Physician Clinic and Medical wards from Hospital Kuala Lumpur were recruited. Essential hypertension was diagnosed in individuals with a resting Systolic Blood Pressure (SBP) ≥140 mm Hg and a Diastolic Blood Pressure (DBP) ≥90 mm Hg or in those currently receiving anti-hypertensive therapy. Type 2 Diabetes Mellitus was defined as fasting plasma glucose >7.0 mmol L-1 and the levels were obtained from the medical records of all the patients or in those currently receiving anti-diabetic therapy. Unrelated healthy individuals were collected randomly under the category of plasma glucose level was below 7.0 mmol L-1 and resting SBP <140 and DBP <90 mm Hg on at least two separate occasions. Socio-Demographic and other risk factors were also assessed by using a questionnaire in both Malay and English language. Biochemical analysis: Height and weight of the respondents were measured using the SECA weighing balance with height attachment to the nearest decimal point without shoes. Body Mass Index (BMI) was calculated using the formula, weight (kg)/height (m)2. Peripheral blood was drawn into an EDTA tube (Becton Dickinson, NJ) by a qualified phlebotomist. Plasma was separated from the blood by centrifugation method and the plasma was stored at -20°C for further analysis. Separated plasma was then performed to determine the level of triglycerides (TG), high density lipoprotein cholesterol (HDL-C), Total Cholesterol (TC) on hitachi-912 Autoanalyser (Hitachi, Germany) using roche Diagnostics kits (Mannheim, Germany). Low density lipoprotein cholesterol (LDL-C) was calculated by Friedewald formula (Friedewald et al., 1972). Genotyping methods: DNA from blood was extracted using Genomic DNA Extraction Kit from BioBasic (Canada). The steps to extract the genomic DNA from the blood were carried out using manufacturer`s protocol. The concentration and the purity of extracted DNA was quantified using Biophotometer instrument (Eppendorf, Germany). PCR amplification was performed in a total volume of 25 μL reaction mixture contained 20 pmol of sense, 5`-CTG ACG AAT GTG ATG GCC GC-3`; antisense, 5`- TTG ATG AGT TCC ACG TAT TTC G-3` (synthesized by Research Biolabs, Malaysia) primer (Keavney et al., 1998), 0.4 mmol L-1 each dNTP, 2 mmol L-1, MgCl2, 1x Taq buffer and 1 unit of NEB Taq DNA polymerase (New England Biolabs, Beverly, MA, USA) and template DNA. PCR cycling conditions were performed for amplification under the following cycling conditions: initial denaturation step of 3 min at 95°C followed by 35 cycles of denaturation at 95°C (30 sec), annealing at 58°C (45 sec) and extension at 72°C (30 sec) and a final step of 5 min at 72°C was carried out on iCycler instrument (BioRad Laboratories, California, USA). 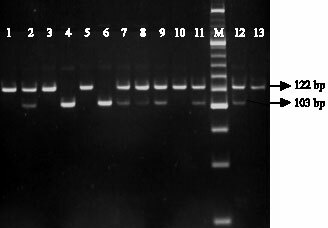 The amplified PCR product was separated using agarose gel electrophoresis method. The PCR products was digested with 2 units of BstuI restriction enzyme (New England Biolabs, Beverly, MA, USA) at 37°C for 3 h with 1x NEB buffer 3, in a final volume of 20 μL reaction mixture. The PCR digested products were separated using 6% non-denaturing polyacrylamide gel electrophoresis and performed in the electrophoresis tank (Techne, Burlington USA) and then stained in ethidium bromide for 10 min. The restricted fragments were visualized under UV light using Alpha ImagerTM 1220 (Alpha Innotech, San Leandro, CA). Approximately 5% of samples were genotyped at a separate occasions and showed identical results. Statistical analysis: All the data of clinical characteristics of the subjects were expressed as mean±SD. Chi-square test was performed to determine the distribution of genotypes and alleles was assessed for deviation from the Hardy-Weinberg equilibrium. Two-tailed student`s t-test was performed for continuous variables to compare between the groups. All the statistical analysis was carried out by using SPSS (Chicago, IL) software version 13.0 for windows. A level of p<0.05 was considered statistically significant. Baseline characteristics: A total of 300 subjects were approached and 265 subjects were chosen, since 35 subjects were excluded due to the inconsistent results. This study has a total of 265 subjects consisting of 70 (26.42%) hypertensive subjects 51 (72.86%) males and 19 (27.14%) females, 60 (22.64%) Type 2 Diabetes 33 (55%) males and 27 (45%) females, 65 (24.53%) T2DM with EHT 40 (61.54%) males and 25 (38.46%) females and 70 (26.41%) unrelated healthy individuals as controls 38 (54.29%) males and 32 (45.71%) females. The majority of the subjects were males; 162 (61.13%) compared to females; 103 (38.87%). Patients were ranged from 31-84 years old, with a mean age of 57.71 years, while the controls were ranged from 30 to 74 years old, with a mean of 45.96 years, nearly 70% of the pateints had family history of either hypertension or type 2 diabetes, while controls had a negative family history in order to participate in this study. The clinical characteristics of the patients show significantly higher mean levels with respect to age, SBP, DBP, glucose and LDL-C than control subjects (p<0.05) (Table 1). There was no significant difference found in BMI of hypertensive group (p = 0.078), but it was significantly differed in T2DM and EHT+T2DM subjects (p<0.05). HDL-C found significantly differed in T2DM (p = 0.01) as well as in hypertensive subjects (p = 0.02) but no significant difference was found in SBP (p>0.05). Moreover, there was no significant difference found in other risk factors such as, Total cholesterol and Triglycerides between case and control subjects (p>0.05). G2350A polymorphism: This study shows that A allele of G2350A polymorphism of ACE gene was statistically significant in association with essential hypertension and Type 2 Diabetes Mellitus patients as compared to controls in Malaysian subjects. The genotypes of G2350A polymorphism have been allotted on the basis of the pattern of bands on gel electrophoresis. Allele G2350 was visualized as a 122 bp fragment and allele A2350 as 103 bp and 19 bp fragments (Fig. 1). The distribution of genotypes of G2350A polymorphism of ACE gene in Malaysian subjects showed deviation from Hardy-Weinberg equilibrium (p<0.05). The genotypic and allelic distributions among the subjects were shown in (Table 2). The GG, GA and GA genotypes of ACE gene are 41.43, 48.57 and 10%, respectively in group 1 (p = 0.032), whereas in group 2; 46.67, 36.67 and 16.66% (p = 0.019) was observed respectively, in group 3 the genotypes were 32.31, 53.85 and 13.84% (p = 0.001), respectively as compared to 61.43, 35.71 and 2.86% in control subjects respectively. The derived allele frequency for A allele was 34.29% in EHT, 35% in T2DM, 40.77% in EHT+T2DM as compared to 20.71% in control subjects. The frequencies of G2350A polymorphism of ACE gene was associated with essential hypertension and T2DM (p<0.05). The effect of gender on hypertension and T2DM was also considered in this study for ACE gene. Table 3 shows there was no significant gender-mediated preferential distribution difference in either genotypic or allelic distribution in both male and female subjects (p>0.05). In addition, we also stratified the data according to the three main ethnic races in Malaysian population. There was no significant difference (p>0.05) in the genotype frequencies between Malays, Chinese and Indians in either case or control subjects (data not shown). To identify the confounding factors for G2350A polymorphism of ACE gene, ANOVA was performed using the general linear model procedure to compare the association between the G2350A polymorphism genotypes (GG, GA, AA) and clinical values (Table 4). There was no significant differences found in age, SBP, DBP, BMI with the genotypes of G2350A polymorphism of ACE gene. Several studies suggested that ACE gene as a potential candidate gene for hypertension as well as for Type 2 Diabetes Mellitus, since it plays an important role in Renin Aldosterone-Angiotensin System in regulating the blood pressure. Rigat et al. (1990) reported that more than half of the variance in plasma ACE levels is due to the influence of I/D polymorphism of ACE gene. After that, several polymorphisms have been identified in association with hypertension and T2DM. But, there has been a considerable controversy over the association of ACE polymorphisms and the disease status which might be due to the different genetic background of the studied populations. The ACE gene I/D polymorphic locus, identified in a non-coding sequence, are more likely to serve as a genetic marker because of its Linkage Disequilibrium (LD) with a putative disease-causing locus located nearby. Linkage and association analysis was done for 13 polymorphisms in the ACE gene in a Nigerian population (Zhu et al., 2001). Among that, G2350A polymorphism was accounting for 19% of the total variance in ACE plasma levels. After adjustment for the effect of the G2350A polymorphism of ACE gene, I/D polymorphism was no longer associated with ACE levels. The results of that study indicates that, I/D polymorphism is in LD with the G2350A polymorphism and unlikely to be a functional mutation. Association studies of ACE G2350A polymorphism in essential hypertension and other disease have raised many controversial results. This initiated us to examine the association of G2350A polymorphism of ACE gene in EHT and T2DM in Malaysian subjects. To our knowledge, there have been no previous reports available in Malaysia regarding the G2350A polymorphism of ACE gene. Probably, this is the first study to determine the association of G2350A polymorphism of ACE gene in EHT and T2DM in Malaysia. We found that, allele A of G2350A polymorphism of ACE gene is associated with essential hypertension and Type 2 Diabetes Mellitus in Malaysian subjects which is similar to a study done in Gulf population (p<0.05) (Mahmood et al., 2003). But, A allele carrier showed no significant difference in distribution of the three genotypes between the age, SBP, DBP and BMI which is in agreement with their study and also with Emirati population study (p = 0.217) in acute MI patients and controls (Iqbal et al., 2004). However, in Emirati population study, the G2350A polymorphism were not in agreement with predicted Hardy-Weinberg equilibrium values, either in the acute MI or control group. AA genotype and A allele of ACE gene was shown high prevalence of 92.86% and 83.14% respectively in patients as compared to 7.14% and 16.86% control subjects respectively. The frequency of A allele of G2350A polymorphism in EHT+T2DM patients (40.77%) has to be found higher than control subjects (20.17%).This result was not in agreement with the reported study carried out in the Pakistani population (p = 0.64) in MI patients (Iqbal et al., 2004) and also in essential hypertensive patients which showed no significant difference (p = 0.145) in distribution of the three genotypes of G2350A polymorphism in Chinese Han population (Pan et al., 2007). However, there was no significant difference (p>0.05) found between male and female subjects in related to ACE genotypes, which is in accordance with those studies. Dyslipidemia has been shown to be a risk factor for cardiovascular disease and coronary heart disease in patients with or without a history of T2DM (Laakso et al., 1993). In our study, the T2DM group had significantly higher plasma levels of LDL-C and lower HDL-C levels than the controls. But we didn`t find any statistical differences in lipid profiles among the 3 genotypes (GG, GA and AA) in between the two groups. In spite of less sample size compared to Emirati population study (118 EHT and 136 controls), our study strongly supports the previous hypothesis that, ACE gene polymorphism are in predisposition to essential hypertension and Type 2 Diabetes Mellitus. However, there was no association in related to gender, three major ethnics (Malay, Chinese and Indians) in Malaysia and the confounding factors. This might be due to the environmental and ethnic difference of different populations which alters the estimates of heritability (Persu, 2006). However, this study is recommended to confirm the association of G2350A polymorphism with essential hypertension and Type 2 Diabetes with larger sample size and better study design. This study concludes that, AA genotypes and A allele of G2350A polymorphism of Angiotensin Converting Enzyme gene provide an adequate evidence on association with Essential Hypertension and Type 2 Diabetes Mellitus in Malaysian subjects. This study was supported by Ministry of Science, Technology and Environment (MOSTE), IRPA Project Grant No. 06-02-04-10054-EAR. The authors would like to extend their gratitude to all the volunteers involved in this study. Agachan, B., T. Isbir, H. Yilmaz and E. Akoglu, 2003. Angiotensin converting enzyme I/D, angiotensinogen T174M-M235T and angiotensin II type 1 receptor A1166C gene polymorphisms in Turkish hypertensive patients. Exp. Mol. Med., 35: 545-549. Anuradha, S., V. Radha, R. Deepa, T. Hansen, B. Carstensen and O. Pedersen 2005. A prevalent amino acid polymorphism at codon 98 (Ala98Val) of the hepatocyte nuclear factor-1 alpha is associated with maturity-onset diabetes of the young and younger age at onset of type 2 diabetes in Asian Indians. Diabetes Care, 28: 2430-2435. Araz, M., N. Yilmaz, K. Gungor, V. Okan, Y. Kepekci and A.S. Aynacioglu, 2001. Angiotensin-converting enzyme gene polymorphism and microvascular complications in Turkish type 2 diabetic patients. Diabetes Res. Clin. Pract., 54: 95-104. Feng, Y., T. Niu, X. Xu, C. Chen, Q. Li, R. Qian, G. Wang and X. Xu, 2002. Insertion/deletion polymorphism of the ACE gene is associated with type 2 diabetes. Diabetes, 51: 1986-1988. Friedewald, W.T., R.I. Levy and D.S. Fredrickson, 1972. Estimation of the concentration of low-density lipoprotein cholesterol in plasma, without use of the preparative ultracentrifug. Clin. Chem., 18: 499-502. Iqbal, M.P., S. Mahmood, N. Mehboobali, M. Ishaq, T. Fatima, S. Parveen and P. Frossard, 2004. Association study of the angiotensin-converting enzyme (ACE) gene G2350A dimorphism with myocardial infarction. Exp. Mol. Med., 36: 110-115. Keavney, B., C.A. McKenzie, J.M. Connell, C. Julier, P.J. Ratcliffe, E. Sobel, M. Lathrop and M. Farrall, 1998. Measured haplotype analysis of the angiotensin-I converting enzyme gene. Hum. Mol. Genet., 7: 1745-1751. Laakso, M., S. Lehto, I. Penttila and K. Pyorala, 1993. Lipids and lipoproteins predicting coronary heart disease mortality and morbidity in patients with non insulin-dependent diabetes. Circulation, 88: 1421-1430. Lim, T.O. and Z. Morad, 2004. Prevalence, awareness, treatment and control of hypertension in the Malaysian adult population: results from the national health and morbidity survey 1996. Singapore Med. J., 45: 20-27. Mahmood, M.S, K. Saboohi, S. Osman Ali, A.M. Bokhari and P.M. Frossard, 2003. Association of the angiotensin-converting enzyme (ACE) gene G2350A dimorphism with essential hypertension. J. Hum. Hypertens, 17: 719-723. McCarthy, M.I., 2004. Progress in defining the molecular basis of type 2 diabetes through susceptibility gene identification. Hum. Mol. Genet., 13: 33-41. Mondry, A., M. Loh, P.Liu, A.L. Zhu and M. Nagel, 2005. Polymorphisms of the insertion/deletion ACE and M235T AGT genes and hypertension: Surprising new findings and meta-analysis of data. BMC. Nephrol., 6: 1-11. Nikzamir, A., M. Nakhjavani, T. Golmohamadi and L. Dibai, 2008. Association of angiotensin-converting enzyme gene insertion/deletion polymorphism with metabolic syndrome in Iranians with type 2 diabetes mellitus. Arch. Iran Med., 1: 3-9. Pan, M., J.H. 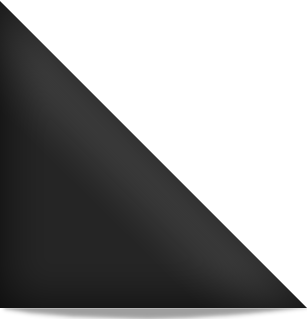 Zhu, Z.H. Liu, W.P. Jiang and Z.C. Cui et al., 2007. Angiotensin-converting enzyme gene 2350 G/A polymorphism is associated with left ventricular hypertrophy but not essential hypertension. Hypertens Res., 30: 31-37. Persu, A., 2006. Candidate gene studies: Accepting negative results. J. Hypertens, 24: 443-445. Rigat, B., C. Hubert, F. Alhenc-Gelas, F. Cambien, P. Corvol and F. Soubrier, 1990. An insertion/deletion polymorphism in the angiotensin I-converting enzyme gene accounting for half the variance of serum enzyme levels. J. Clin. Invest., 86: 1343-1346. Shafie, O., I. Fatanah and D. Noor Azah, 2004. Diabetes program in malaysia-current and future. NCD Malaysia, 3: 6-12. Turner, R.C., H. Millns, H.A. Neil, I.M. Stratton, S.E. Manley, D.R. Matthews and R.R. Holman, 1998. Risk factors for coronary artery disease in non-insulin dependent diabetes mellitus: United Kingdom prospective diabetes study (UKPDS: 23). Br. Med. J., 316: 823-828. Zhu, X., N. Bouzekri, L. Southam, R.S. Coope and A. Adeyemo et al., 2001. Linkage and association analysis of angiotensin I-converting enzyme (ACE)-gene polymorphisms with ACE concentration and blood pressure. Am. J. Hum. Genet., 68: 1139-1148.